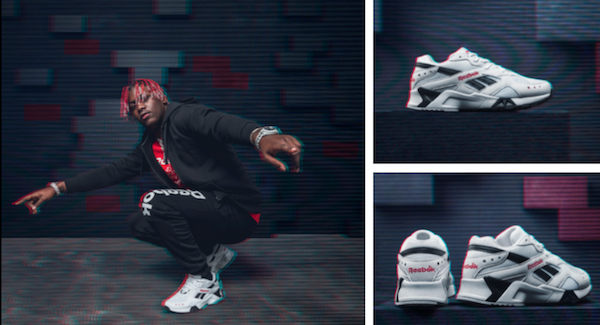 Reebok Classic and brand partner Lil Yachty announce the latest colorway of the Aztrek: Reebok’s futuristic, off-road runner first introduced in ’93. Now available in a classic shade of black and red, the shoe retails for $90 on Reebok.com. Crossing artistic boundaries and blending genres, Lil Yachty has changed the face of hip-hop. Throughout his career he has always sought a different path and carved out his own creative space, shaking off the expectations of others in pursuit of his original sound. In the campaign video, Reebok Classic showcases Lil Yachty’s bold and unapologetic style as he speaks candidly about 90s attitude and being proud of your true identity. For FW18 Lil Yachty is styled in the Aztrek: the silhouette combines tech-functionality with retro design, featuring a generous ride height and Reebok’s Hexalite tech in the heels. Asymmetrical reinforcements give the toe area an off-kilter vibe. From the track to the streets, the Aztrek remains true to its Classic heritage, with its effortless blend of ‘90s attitude and authentic performance, this Reebok Classic slots right back into the roster like it never left. Print article This entry was posted by Art Eddy III on October 5, 2018 at 10:58 am, and is filed under Uncategorized. Follow any responses to this post through RSS 2.0. Both comments and pings are currently closed.